Perform sling exercises correctly. Get a better training experience with professional guidance in your Redcord training app! Sling suspension exercises can provide faster results for everyone who wants to perform better, prevent injuries, avoid pain, or just stay active. 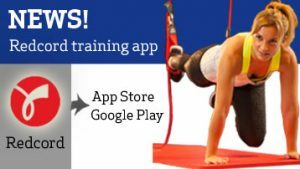 The Redcord training app is FREE, and includes 350 different sling exercises. You can easily search for exercises, and add them to your favorites. The app provides complete workouts for the abdomen, back and for different sports. With this app you will get expert guidance on how to enhance your physical fitness and get the most out of your training.The exercises appear as videos with muscle illustrations and written explanations. You can choose between English, Norwegian, Danish, Swedish, and Finnish language. Sling suspension exercises are gentle and effective. Redcord has for many years worked with both physiotherapists and athletes. It is suitable for all ages, time efficient, and easy to customize to all levels of physical conditions. Our sling exercises provides fast and proven efficacy for anyone who would like to perform better or prevent injuries. With the Redcord training app in your pocket, you can bring your workout anywhere, whether at home, at the gym, or on travel. Download to your smartphone on Google Play / App Store NOW for FREE.